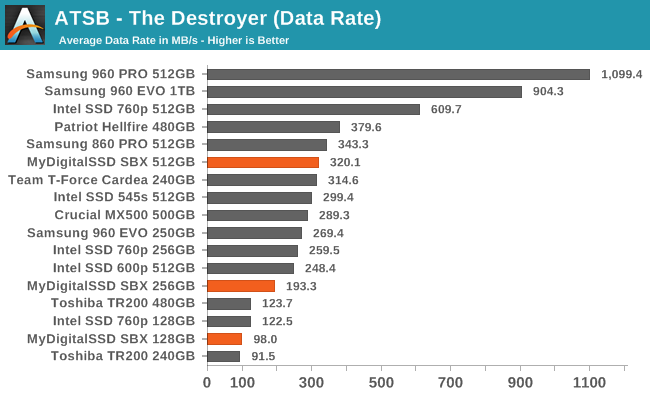 The average data rates from the MyDigitalSSD SBX on The Destroyer are faster than most but not all SATA SSDs of comparable capacity. As expected, the SBX is one of the slowest NVMe SSDs, but it does outperform the Intel SSD 600p. 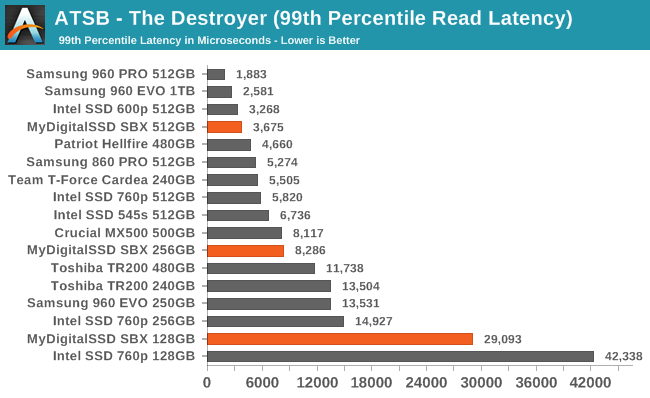 Average and 99th percentile latencies from the SBX on The Destroyer are generally higher than for other NVMe SSDs, but it isn't a drastic outlier like a DRAMless SATA drive. 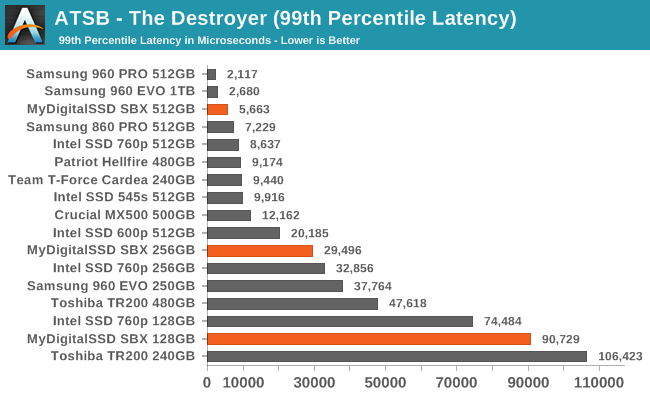 The larger two capacities actually beat several competitors for 99th percentile latency. 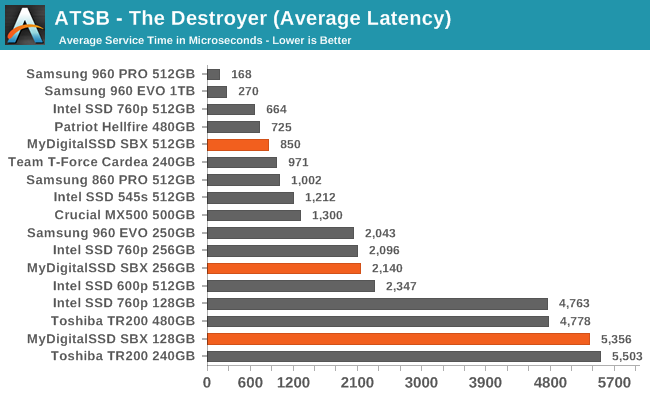 The smaller two capacities of the MyDigitalSSD SBX have slightly better average read latency than the Intel SSD 760p. 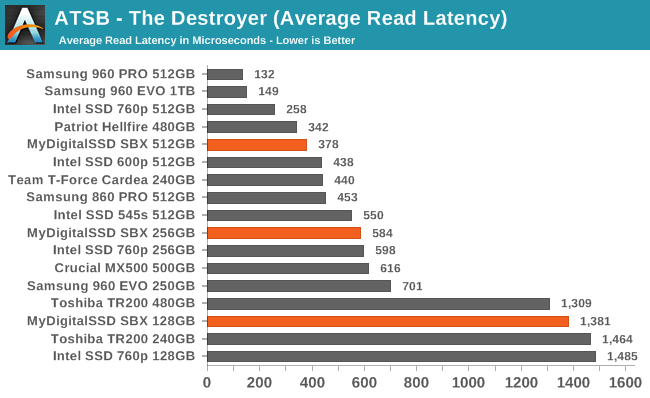 Otherwise, average read and write latencies are higher than most other NVMe SSDs but are still better than SATA drives. 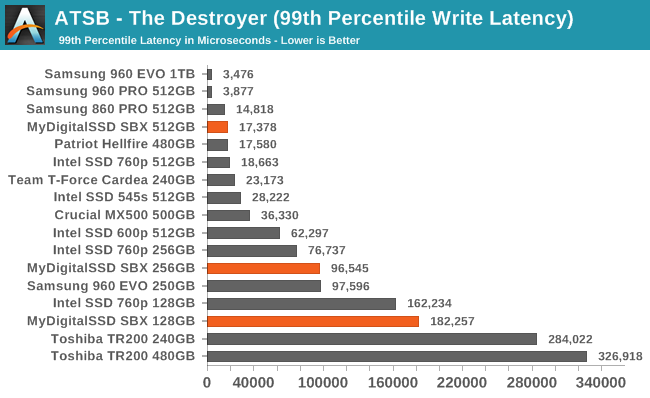 The MyDigitalSSD SBX has reasonable 99th percentile read and write latency scores—especially the 512GB model. 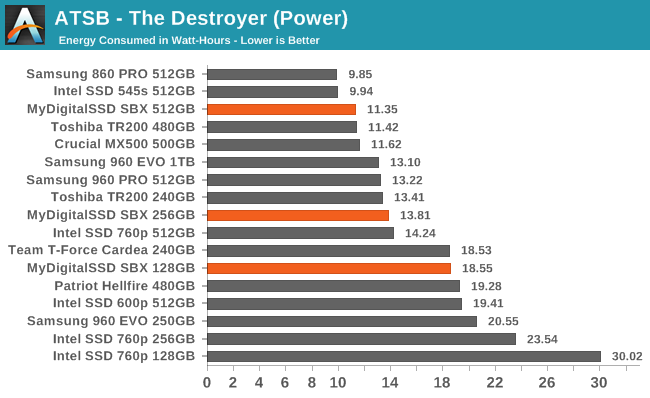 The smaller capacities have much higher tail latencies, but are not as bad as the Intel 760p. Energy usage by the MyDigitalSSD SBX on The Destroyer varies widely between the different capacities. The 512GB SBX uses very little energy by NVMe standards, but the smaller drives take much longer to complete the test and use substantially more total energy by the time they finish. The popular budget Micron 3D TLC 2TB drives are on sale all the time from $280-$300 range. They don't have much marketing or even a fancy name associated with them, come in a bare OEM type box but the few reviews out are all favorable. 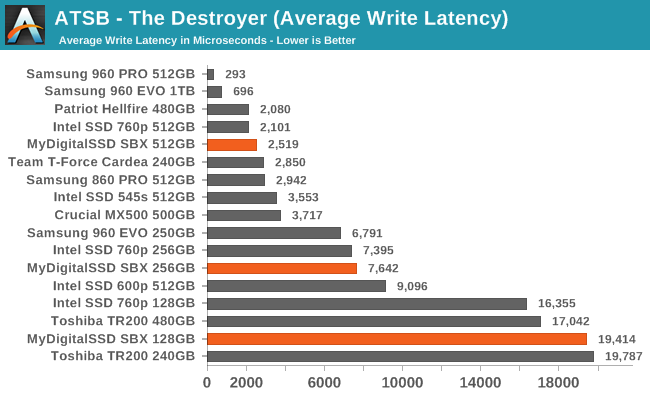 I have one as a secondary storage drive with a 960 EVO 500GB boot drive but tbh when I moved my Steam library over to it, I can't even tell the difference in performance between it and the NVMe EVO.